ACL Staticide - DUALMAT - ROHS Compliant - Roll - 30” x 40' Royal Blue. A heavy duty ESD safe material for tables and benches in environments where static control and contamination are concerns. ...This two-ply industrial-grade elastomer is chemically crossed linked to conform to strict ESD and lead-free requirements. It is permanently dissipative and will not lose its electrical properties. 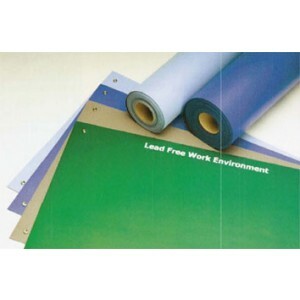 It is as durable as rigid laminates and as comfortable and appealing as softer rubber or vinyl mats. Available in your choice of: Royal Blue, Light Blue, Dark Gray and Green. Precut mats have two 10mm snaps installed. Grounding hardware is separate. Reversible laminate has two different electrical resistances (Back side is conductive, colored side is dissipative). Black side of mat can be used for fiber optics. Colored side is ideal for electronic manufacturing. ELECTRICAL PROPERTIES @12% RELATIVE HUMIDITY FOR COLORED SURFACE: Resistance between two points (RTT): 2.1 x 10~7 ohms @10 volts per ANSI/ESDA S4.1 1.3 x 10~7 ohms @100 volts per ANSI/ESDA S4.1 Resistance between point to ground (RTG): 6.1 x 10~7 ohms @10 volts per ANSI/ESDA S4.1 5.3 x 10~7 ohms @100 volts per ANSI/ESDA S4.1 Volume Resistivity: 4.6 x 107 ohms - cm For additional information, please contact Customer Care.